In our last post, we presented several ways that eye tracking technology is improving lives, from commercial applications to health screenings. Let’s take a look at a few more ways eye tracking is making our world a better place. Our websites are more effective. Eye tracking can be used to access and improve website usability, making websites more effective at reaching their goals, whether they intend to inform, entertain, or prompt us to make a purchase. Technologies, like our EyeFollower, provide a natural environment for conducing eye tracking studies so that website owners can get the most accurate information possible. We follow users’ gaze while they are searching for, and processing, information on a website, so webmasters can improve the user experience. We assist ALS patients in leading fuller lives. Patients with mobility-limiting diseases, such as ALS, can benefit greatly from eye tracking technology. 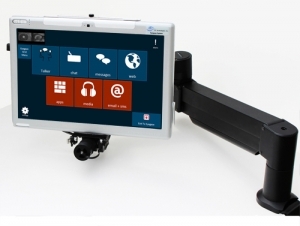 Our Eyegaze Edge is an eye-operated communication and control system that allows ALS patients to communicate and interact with the world. Eyegaze Edge users are writing books, attending school, and communicating with their loved ones – all through the power of their eyes. We can diagnose autism earlier. Research shows that infants who go on to develop autism not only look at faces less than other babies do, but they also look away from major facial features when a person speaks. Yale University School of Medicine researchers recently presented these ground-breaking findings that can help diagnose autism in children as young as 6 months of age. The researchers used eye tracking to carry out their studies and are hopeful that early detection can lead to social and behavioral interventions to help these young patients recover. As you can see, eye tracking technology has numerous applications across many industries. Which of these eye tracking use cases inspires or excites you the most?